First plant hormone discovered was auxin. 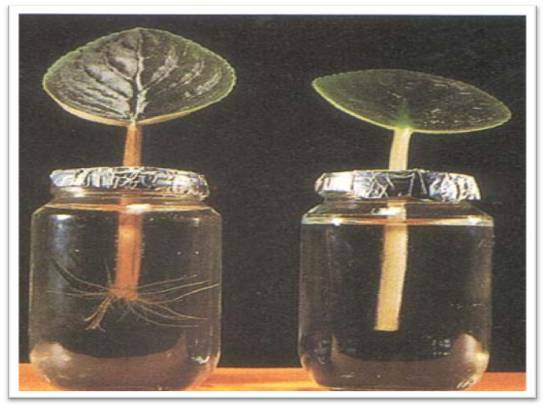 2, 4-D : high concentration toxic to dicots (broad leaved plants) but monocots are resistant. Mode of action of 2,4-D as a weedicide? Auxin synthesis :Auxin Precursor: Amino acid Tryptophan. The essential element required for the synthesis for tryptophan is zinc. Acropetal transport in the root (from base to top). Proton Motive Force(PMF) : a pH gradient is created along the plasma membrane that facilitate the transport of auxin. IAA efflux carrier: auxin transporting cells have IAA efflux carrier in their basal part. Auxin can enter cells through by diffusion or influx transporters like AUX I in the plasma membrane and moves out through efflux transporters called PIN proteins: transmembrane proteins inserted in localized portions of the PM. What are PIN proteins? Are auxin efflux transporters. What are Phytotropins? Are inhibitors of polar transport (auxin transport inhibitors). Phytotropins (transport inhibitors) and anti auxins are different! What are Anti auxins? -inhibits effects of auxin. Auxin > increased proton pumping > H+ to acidify cell wall > cell wall loosens (expansin protein catalyze pH dependent wall extension growth > turgor pressure pushes loosened wall and growth occurs.